One of the historic turning points in human intellectual history in this new era took place a few hundred yards from Lewis Carroll’s residence. This was the famous 1860 Oxford Darwinian Debate in which the bombastic anti-Evolutionist Wilberforce was verbally eviscerated by the rational pro-Evolutionary Thomas Henry Huxley. Known as “Darwin’s Bulldog,” Huxley’s victory became emblematic of the triumph of progressive rational science. 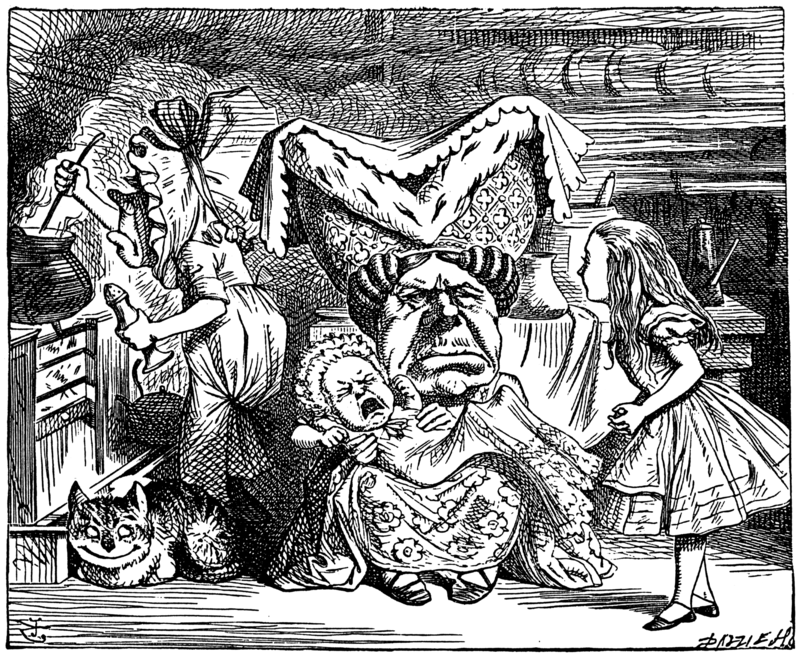 In Wonderland, Carroll’s satire of the Darwin debate takes place in the strange smoke-filled Kitchen of the Ugly Duchess. The Oxford counterpart of the Duchess’ Kitchen is one of the grand sites of the university: Cardinal Wolsey’s Great Kitchen. Built during the reign of Henry VIII, Oxford’s Great Kitchen has a massive hearth for roasting entire pigs and, like the Duchess’ Kitchen, was frequently filled with smoke. The Great Kitchen was also the one part of the university that was directly under the authority of the Bishop of Oxford. Samuel Wilberforce, the son of the anti-slavery movement’s “Great Emancipator” William Wilberforce, was known to parliamentarians and political pundits as “Soapy Sam” because of his brash and illogical debating style. He was the perfect model for the logic-chopping, moralizing, and argumentative Ugly Duchess. In this fantastic “Kitchen of Creation,” one can imagine these insane cooks mixing up a mad biological soup. Evolution is gone berserk. Uniformed fish and frog footmen seem to have just stepped out of the primordial ooze. A constantly shape-shifting baby appears to demonstrate “survival of the fittest” by preferring beatings to affection. 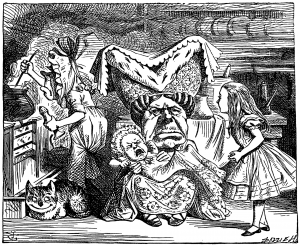 Strangest of all, Alice’s attempt to nurse this child results in a strange backward form of evolution: from a boy into a pig. Well, I always hated that ugly duchess and baby scene anyway! The classical Greek myths related to the founding of the colony of Cyrene in north Africa (Libya) are worth knowing about alongside the biblical narrative of the founding of Israel. This post is a presentation of my understanding of some of the ideas of Philippe Wajdenbaum found in a recent acticle in the Scandinavian Journal of the Old Testament, and that apparently epitomize his thesis, Argonauts of the Desert.